Keiko Kobayashi, the star, co-writer, and co-producer of “Jun-Ai,” has an entire life mission centered around the film. As she makes clear on the film’s website, she wants to help connect people from separate and even antagonistic cultures to communicate with each other in the interest of peace. Having already helped build an elementary school at the foot of China’s Tai Mountain, Kobayashi is no stranger to elaborate projects for the good of humanity. The film opens in rural China, right around Japan’s surrender to the Allied Forces in 1945. During the war, Japan developed colonies on Chinese soil that were resented by the indigenous Chinese, who scorned, attacked, and possibly killed any Japanese who crosses their path. The Japanese settlers, for their part, want nothing more than to get back to Japan after the surrender. But they are hundreds, perhaps thousands, of miles from Japanese soil, and the retreating Imperial Japanese Army is no help. Kobayashi stars as Ai, a young Japanese lady fleeing China with her fiancé Shunsuke, played by actor and singer Yasutaka Kawaguchi. They become separated from their group and seek shelter at a nearby farmhouse. There, they find a Chinese villager, Shanron (played by Pong Bou) and his elderly, blind mother (played by Shaohua Zhang, a 50-year veteran on the stage and screen). The Japanese couple must overcome the revulsion of Shanron, who wants them out of his house immediately. His mother, on the other hand, is older, wiser, and has a more peaceful attitude. Ai and Shunsuke make friends with the mother, but they must outlast Shanron’s fury. They become accommodating, slow streams wearing away the stone in Shanron’s heart. As deftly directed by Jiang Qingmin, the four principal characters grow and change in reaction to each other. They start to see each other as individuals with personalities and feelings, not merely as symbols of oppression and wrath. The cinematographer, Satoru Tateoka, follows the characters with a seasoned eye. The rich dark contours of the indoor sequences contrast with the greens and browns of the rolling hills outside. Small points of light push through darkness in shots of the village at night, with crisp starlight and a beguiling moon. Ms. Kobayashi wants to take “Jun-Ai” to other countries and translate its dialogue into languages other than Japanese, Chinese, and English. She’s traveling through America, and around the world, selling her film and her mission one screening at a time. 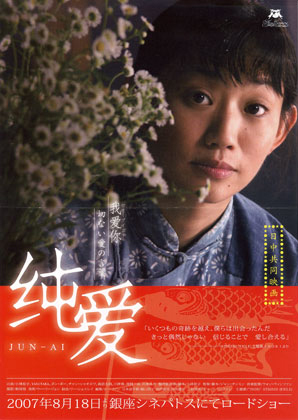 “Jun-Ai” shows at a special screening Saturday, March 16, with actor/co-producer/co-screenwriter Keiko Kobayashi in attendance. The presentation starts at 6 p.m. at the Nisei Veterans Hall, 212 South King Street in Seattle.To purchase tickets, please visit: https://www.ticketriver.com/event/5790 . For more information, call 360-387-4746 or e-mail Midori Kikuchi at midori@ambianceamerica.com. For more information about the film, visit http://jun-ai.biz/.